In the years following World War II, outdoor recreation boomed across the United States as many families saw an increase in their income levels and their leisure time. Trends that had already begun to emerge in the pre-war decades, such as shorter work days and (for many, but not all) a 5-day week, accelerated after 1945. Paid days off, once a rarity, become more common as unions successively bargained for vacation time in many industries. President John F. Kennedy meets with members of the ORRRC. Photo by Abbie Rowe. White House Photographs. John F. Kennedy Presidential Library and Museum, Boston. During the same period, however, open space, especially at the fringes of metropolitan areas and along coastlines, began to decline, a result of both a baby boom and a building boom, the latter a product , at least in part, of federally-subsidized mortgages and an expanding middle-class – though opportunities to buy a home in many areas were limited by racial segregation. Officials at the national level took notice, and in 1958 Congress created the Outdoor Recreation Resources Review Commission (ORRRC) in order to asses the country’s contemporary recreation needs and resources and to make recommendations on future policies and programs. 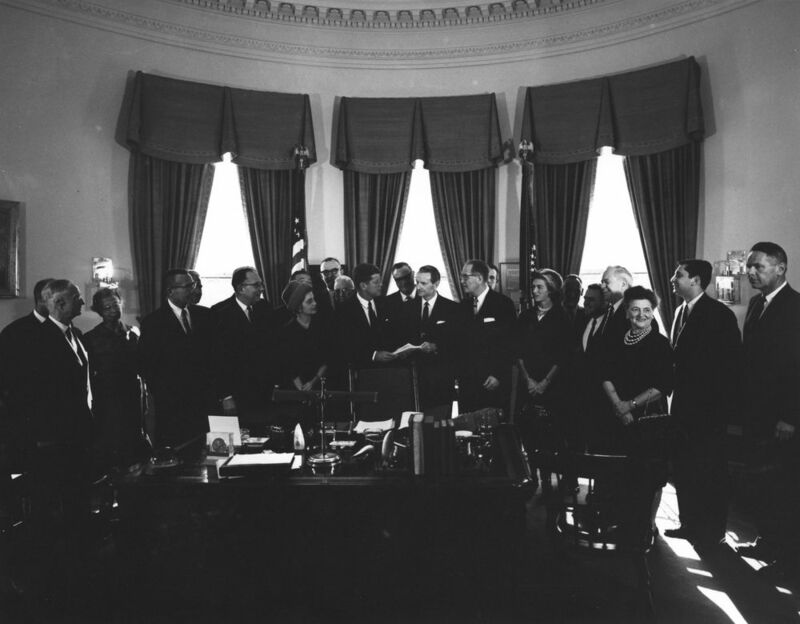 The Commission’s 1962 report, Outdoor Recreation for America, (which was also accompanied by a host of complementary studies by outside consultants), presented by Chairman Laurance Rockefeller to President John F. Kennedy, had a lasting impact on the country’s conservation and land use priorities. For example, the 1962 creation of the Bureau of Outdoor Recreation and the 1964 passage of legislation establishing the Land and Water Conservation Fund are both linked to the findings of ORRRC. One of the more noteworthy reports issued by the ORRRC was Study Report 15: Open Space Action by journalist William Whyte, among the country’s most visible proponents of land conservation and eventual author of the classic text The Last Landscape (1968). Beginning in the 1950’s, Whyte and others mounted a vocal and organized campaign to promote local, state and federal action on open space preservation, proposing various approaches such as enhanced zoning measures, changes in the tax structure and less than fee acquisition, among other options. For an interesting and detailed analysis of Whyte’s impact on the emergence of the “open space” movement, see Adam Rome, “William Whyte, Open Space, and Environmental Activism,” Geographical Review, Vol. 88, No. 2, Historical Geography and Environmental History (Apr., 1998), pp. 259-274.